Has anyone had any problems with UTF-8 in IDEA on Linux? I've created an issues but they think it's just a font issue. I was wondering if others could see UTF-8 characters inside java files. I have set the encoding type to UTF-8. The font is on default but I've tested other font types with no luck. 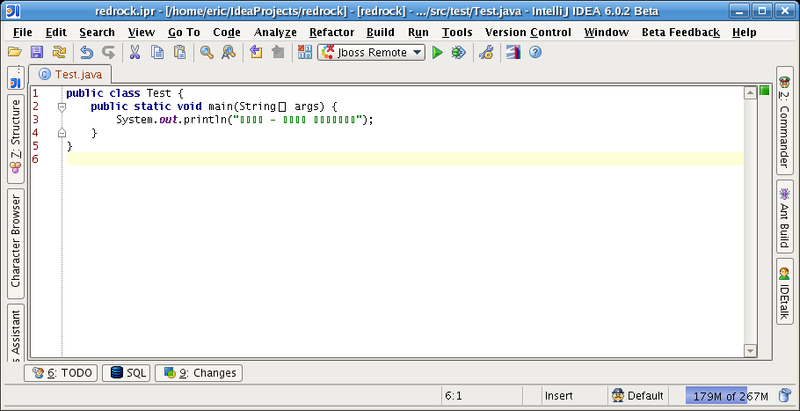 I've attached a Test.java file, download it and see if you can view it in IDEA. We have several mac IDEA users here at work and none of them have this problem. Unfortunatly, I'm the only Linux IDEA users here at work. That's why I need someone other Linux IDEA users to test this for me. I need to find out if I have someone messed up on my system or if it's a bug in IDEA. 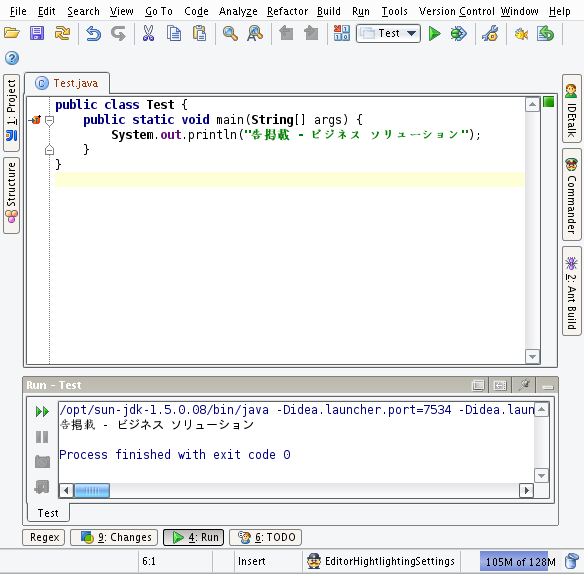 your Test.java and get the same erroneous output as you. Perfect that what I wanted you to confirm. I think it's a bug in IDEA. I had several of the mac guys here at work load up that Test.java file and it works fine for them. I'll take a look into the fontprop, maybe there is a workaround. Here is an interesting thing, UTF8 has work with previous version of IDEA. I believe the earlier version of IDEA 5 worked. these characters in the Settings|Appearance ? tested other font types with no luck. Sascha Weinreuter said "If the file loads and saves correctly it's a font issue. You will need to select an editor font that is capable of displaying the characters your file represents (which is btw independent of the file being UTF-8 encoded)." that hasn't worked either. Mario Ivankovits is also having the same problem. What font you have in Settings|Appearance|Font ? 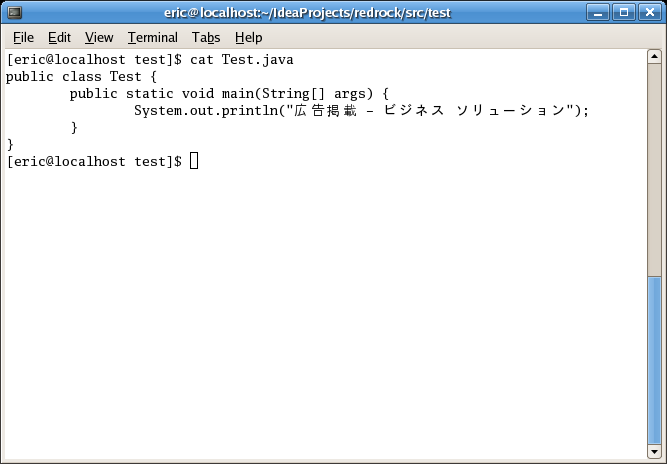 I was wondering if others could see UTF-8 characters inside java files. I have set the encoding type to UTF-8. I'm using 'Bitstream Vera Sans Mono' as my editor font. Font in settings|Appearance|font = I've tried most of them. Right now I have it set to monospace in IDEA. 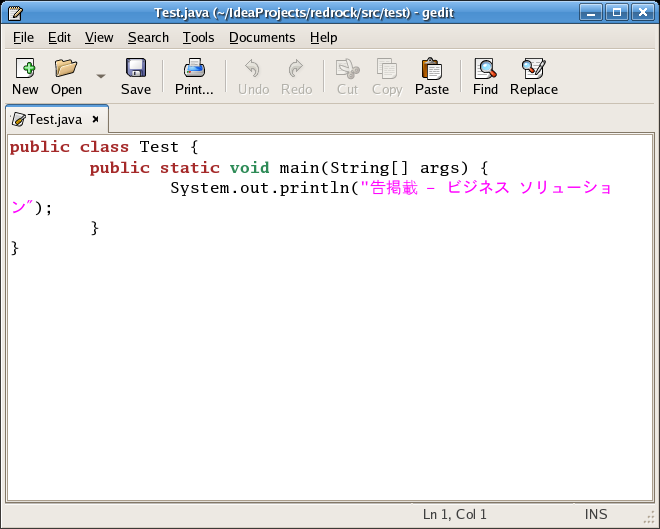 In gedit (the default gnome text editor) I can change the font to any font in gedit and works fine. None of the fonts seem to show UTF8 in IDEA. Futhermore, in gnome terminal I can view the fonts in UTF8 (screenshot cat.png). So I know my system can read and display utf8. For somereason it's not working in IDEA. Ok, well I'm convinced that it works. I somehow must have some sort of setting messed up. I appreciate the screenshot of it working. I appreciate the screenshot of it working. Fonts in editor are controlled by different setting rather all other fonts. So you're to modify Settings|Colors&Fonts rather Settings|Appearance. I've update to build 6083 and it works now. If anyone else has had the same problem as me they should try updating and seeing if that fixes it for them.